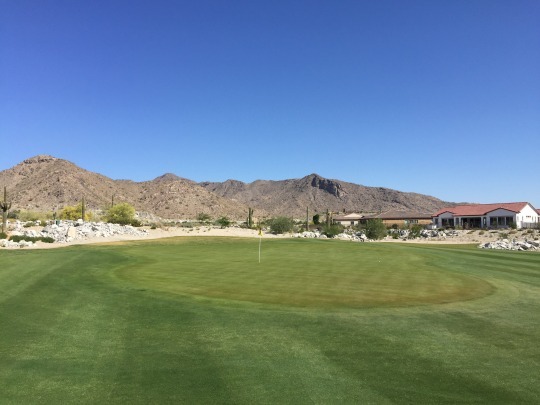 I’ve mentioned my recent move out to Rancho Mirage, which sits in the middle of the Coachella Valley’s golf mecca. Well, another nice perk of living here is that another place loaded with great golf just got closer, too! 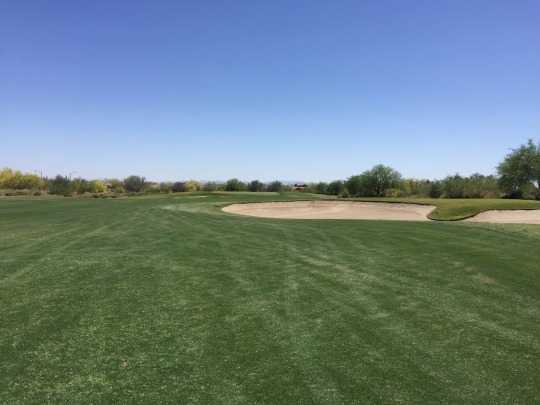 Expect to see a lot more reviews of Arizona courses this year, as there is so much out there I need to play and it’s all within a little closer reach for me now. 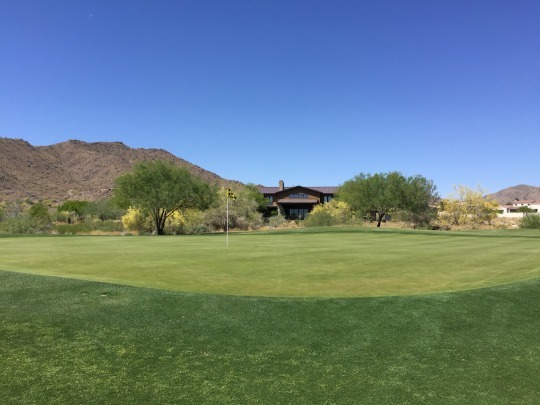 When it comes to the far western side of the Valley of the Sun, it’s only about a 3-hour drive to reach the city of Buckeye. And it just so happens that a new course opened up there this year for a brief sneak preview. The situation was too ideal to ignore. 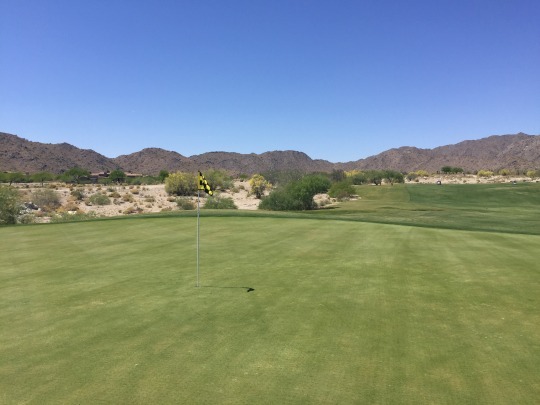 Verrado Golf Club has always known to be one of the best options in the western part of the valley, which really doesn’t have a ton of courses to begin with. 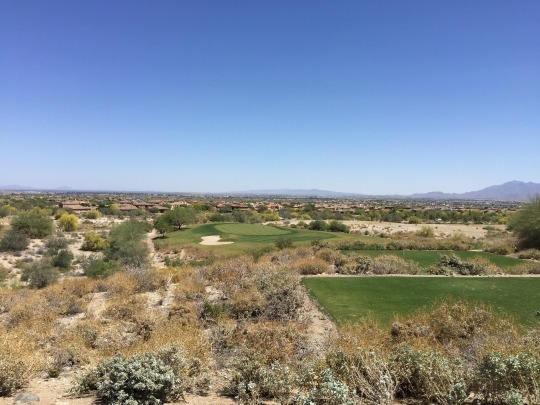 The Verrado community is certainly a nice one. 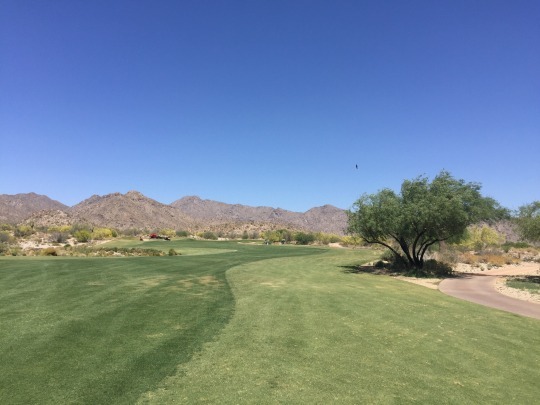 The original course used to be named “Raven Golf Club at Verrado.” I think that confused some people because there is also Raven Golf Club Phoenix in the valley. 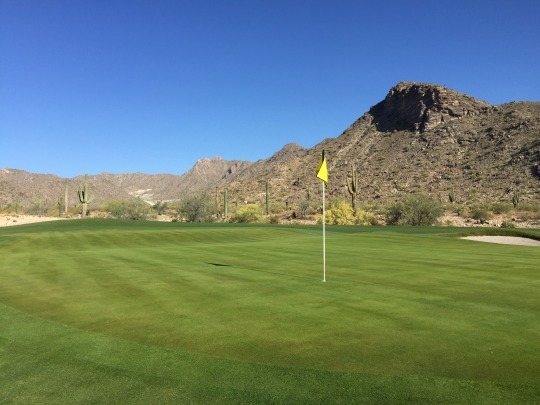 At some point in recent years, they ultimately dropped the Raven name and went with just Verrado Golf Club. 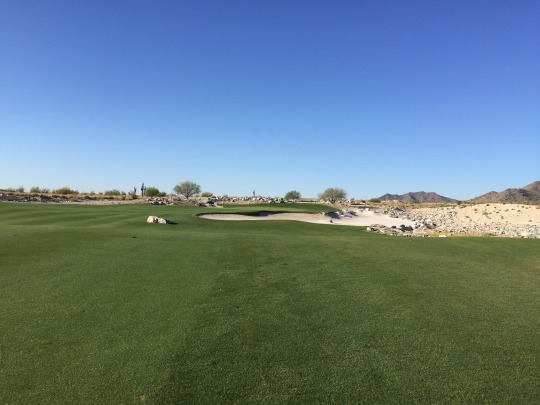 Then, they opened up a new course in a new development within the Verrado community called Victory. 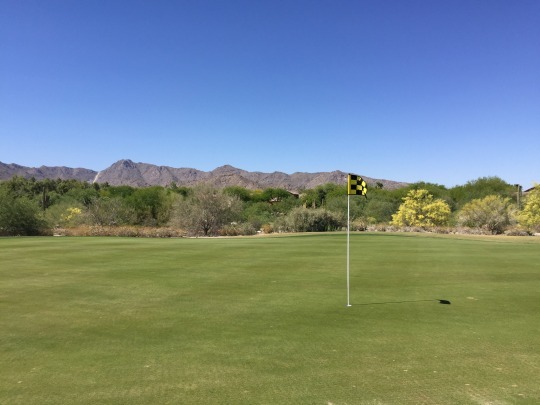 Now, you have The Victory Course at Verrado Golf Club and the original course was renamed again to The Founders Course at Verrado Golf Club. 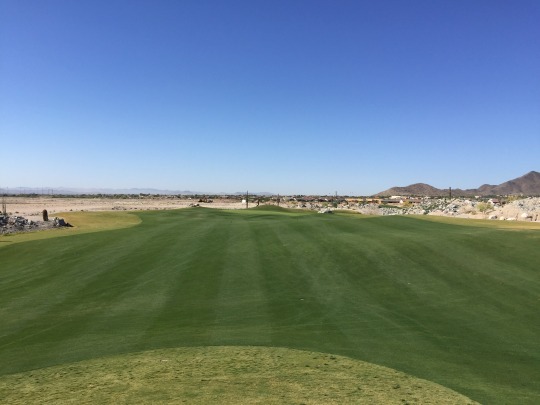 Anyway, they have been offering preview rounds on The Victory Course early this year (reportedly open through April or maybe even into mid-May) in advance of the official grand opening which is slated for this fall or early winter. 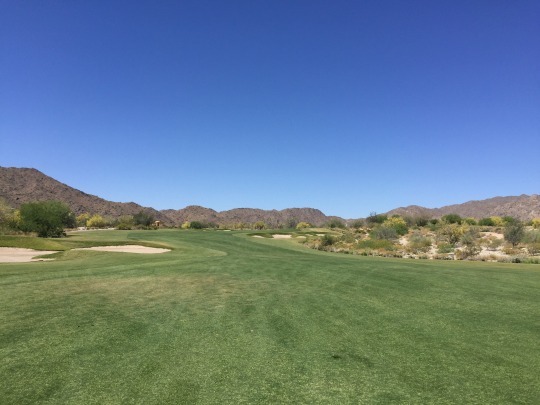 I decided that was a good enough excuse to come out and play 36 holes at both Verrado courses yesterday. I got started on The Victory Course with a 6:30 tee time. I paid the full promo rate they have right now, which is $89 (plus tax). 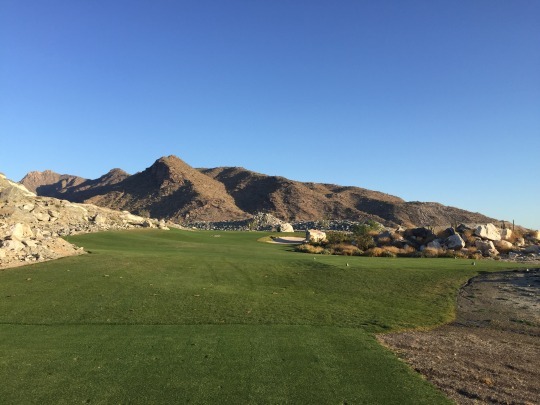 The one nice perk of this price is that it did come with a bounce back voucher that will enable me to come back in December and play either course for only $25. That’s not too shabby when you consider that will be in prime season and more of the construction around The Victory Course (including the large new clubhouse/restaurant on the hill overlooking the course) will be completed. For now, there’s just a temporary trailer used as the pro shop. 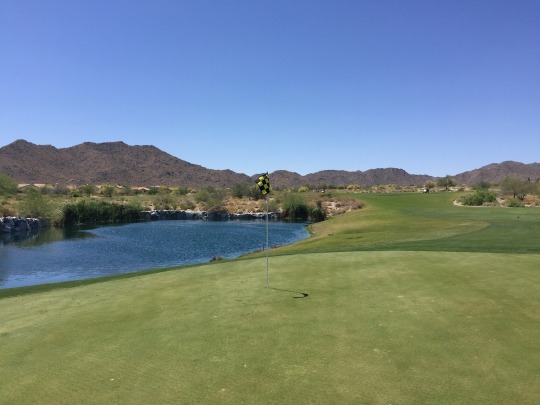 I was paired with three other players, all of whom were Verrado residents/members who provided plenty of insight about both courses. One of them left after nine holes and we finished the whole round in about 3.5 hours. 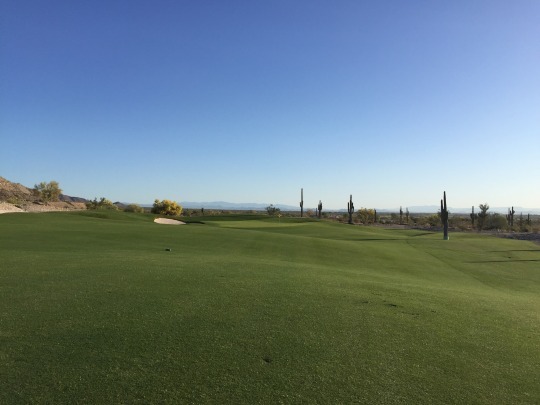 The Victory Course at Verrado was designed by former PGA Tour pro, Tom Lehman. I have only a little experience with his designs, including Arroyo Trabuco in Orange County and I guess he also was part of the renovated design at The Farms in Rancho Santa Fe. Both are courses I like a lot. Victory is the first course I’ve played where only his name was listed as architect. As it is now, Victory has a bit of a raw feel. Remember, this is just a soft preview opening and there is still a lot of work to do over the summer. I think that actually adds some charm in certain areas, while it detracts in other ways. 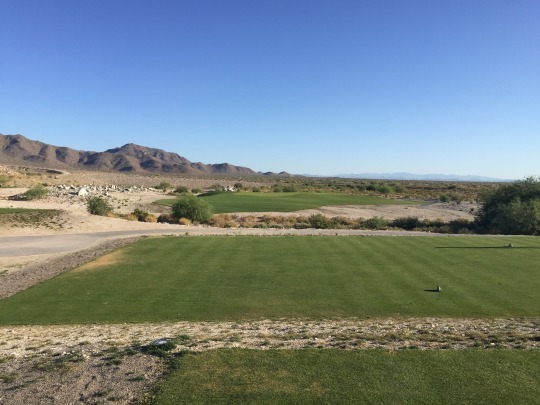 The front nine plays out in open desert and it seems like it will be awhile (or hopefully never) before parts of it are developed with houses. 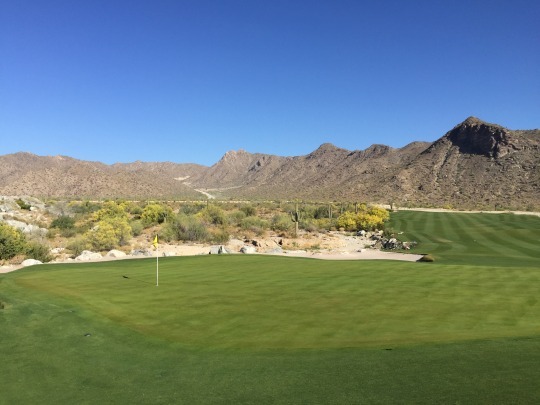 The first few holes are pretty simple and then it starts to get more interesting as you go along, culminating in a nice stretch of holes along the base of a rugged hillside and the 9th hole, which stands out as one of the best and most demanding of the par-4s here. 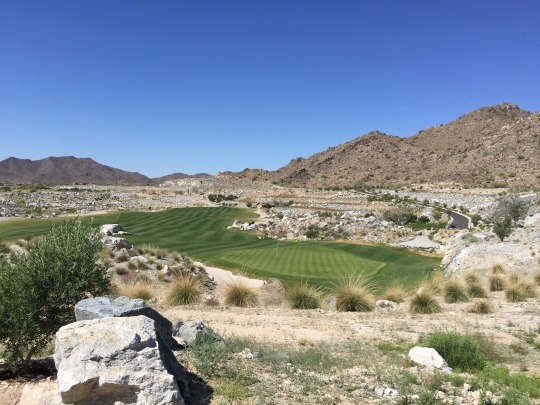 It plays along the edge of a small desert canyon and has a great overall look. 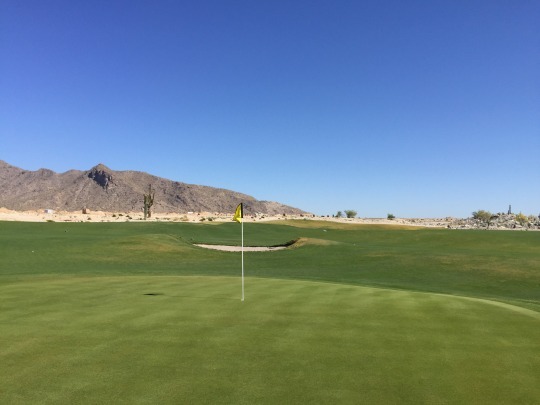 The back nine has a totally different vibe as you play through some areas where a lot of homes were already built and other areas where construction is currently going on. 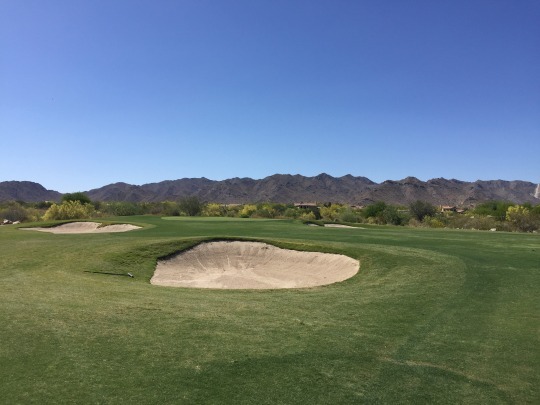 Certainly the construction areas are where the “incompleteness” clearly detracts from the enjoyment of a round (not to mention all the construction noise). I hate to say it, but these parts of the course will be nicer once the homes are complete and the surrounding land is filled in. Easily the standout hole on the back nine is the finishing par-5 18th. 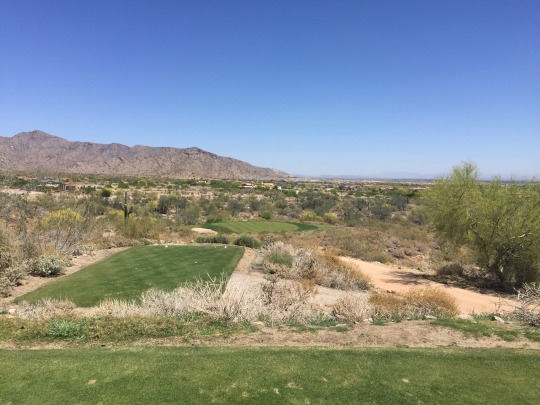 It offers the only significantly elevated tee box and the only water hazard on the course, as well. 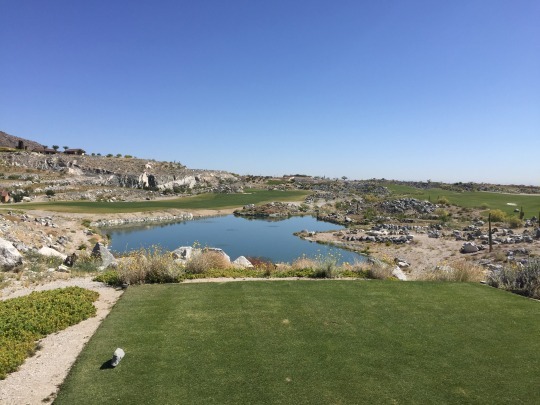 It is a nice tee view and a cool look back from the green as the hole works it’s way uphill between the chiseled-out rock walls. It’s a little reminiscent of Oak Quarry or maybe a poor man’s Wolf Creek on this particular hole. The guys I played with told me that much of the back nine was built earlier as they were previewing and selling homes/plots to new residents. This means some parts of the course are more mature than others. I was pleasantly surprised with the conditions on Victory as it nears its preview closure. Everything was pretty lush and green here. As you might expect, the ground underneath the turf is still pretty firm and it will take more time to mature. The tee boxes were rock hard and it was difficult to get tees into the ground. Plastic tees would bend as you tried to push them in. Wooden tees were an automatic sacrifice to the golf gods. Once they went into the ground, they were not coming back out in one piece! 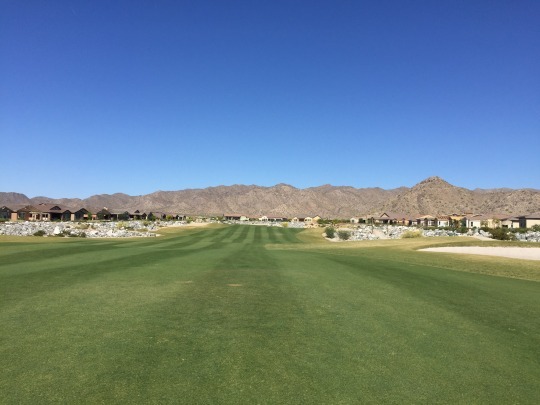 The fairways provided ample roll out, but they were great to hit from. The rough was different from front to back. 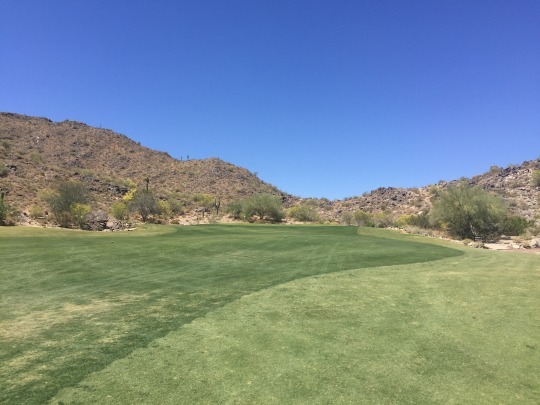 The front nine had overseeded rye, which was lush with good coverage. It was cut very low, though, and provided no punishment at all. 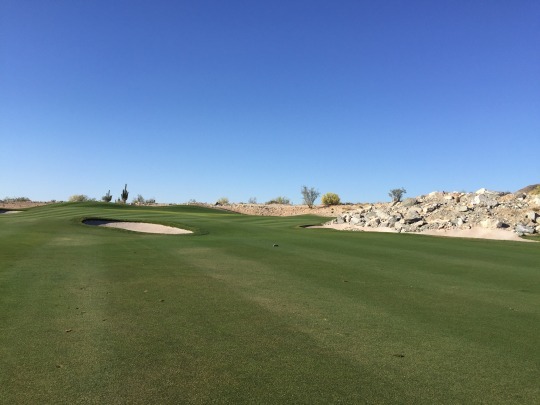 The back nine had semi-dormant bermuda. It was completely shaved down and obviously didn’t look as nice visually. I wasn’t in any bunkers, but they all looked decent. There is some cool bunkering throughout the course. 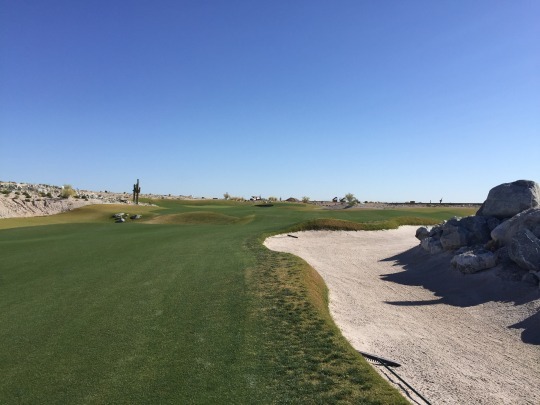 Big boulders are used a lot aesthetically here and some bunkers are actually lined with them. Not always practical, but more interesting looking. The greens were a mixed bag due to the immaturity of the turf and the fact they were all built at different times. All had good turf and were well-maintained. However, the firmness ranged from really firm to rock hard. Approaches and chips were very tough to hold if you landed on the greens. On the flipside, putts ran fairly slow and some ran slower than others. Speeds were inconsistent throughout, with the newer greens (primarily front nine) being slowest and the older greens (primarily back nine) moving a little quicker. I’m not knocking the greens at all. We all know they take awhile (sometimes a year or two) to really mature, so I think they will be great eventually. The fairways are generally very wide on The Victory Course and the greens are very large. 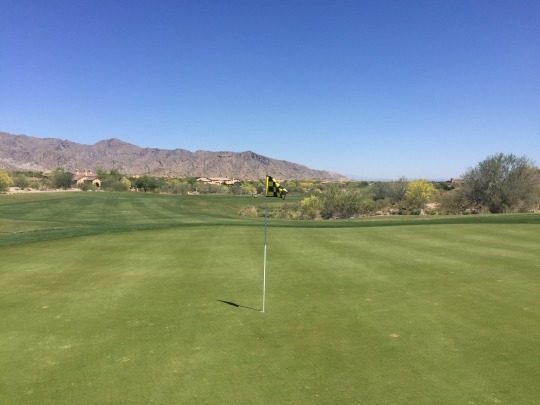 I wouldn’t say that the greens have a lot of undulation, but there are tricky spots on almost all the greens. 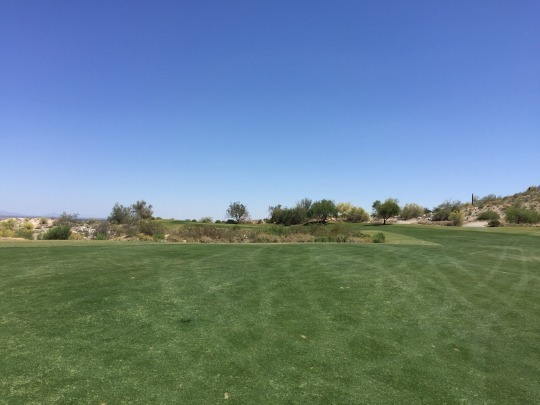 There are shelves, dips and false edges that you cannot always see from the fairway. They are greens that reward course knowledge. The more you play it, the more you will know the different pin positions and the best places to position your approaches. Firing right at the pin (especially while greens are so firm) is rarely a good plan. In many ways, Victory has some links design characteristics. 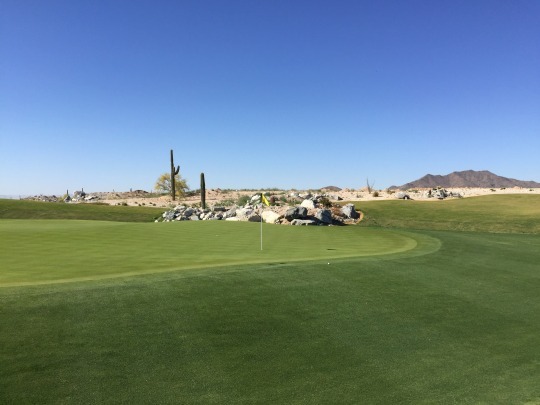 Overall, I felt Victory was a course designed for members. 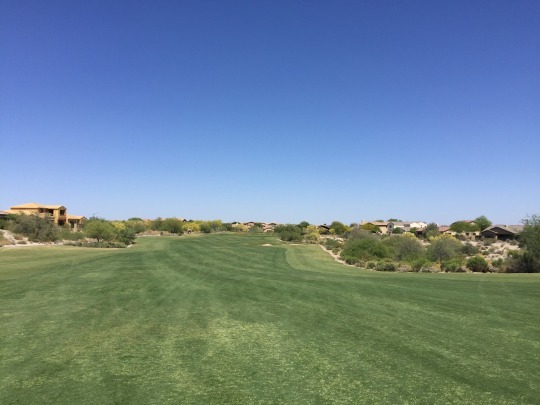 It is forgiving from tee to green in a lot of respects, but also has just enough bite on and around the greens to reward strategic play and give members who know the course well a bit of a home course advantage. 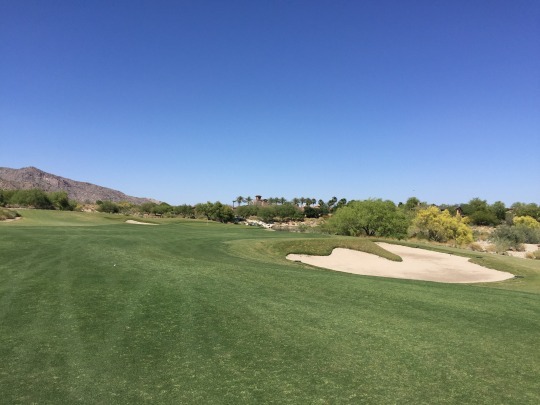 The course also features a handful of short par-4s, which give longer hitters some good risk/reward opportunities. One cool thing here is the variety of tee box and combo options. 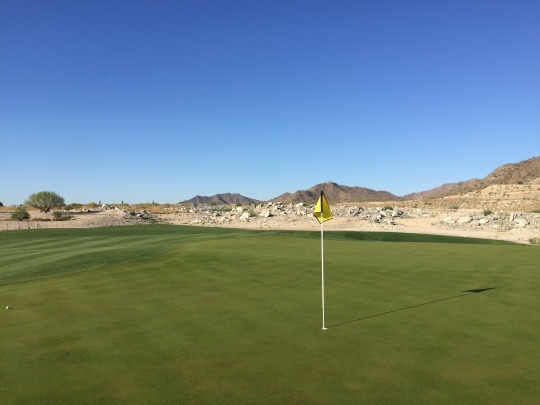 The longest set of tees (black) stretches out to 7,258 yards to add more challenge. 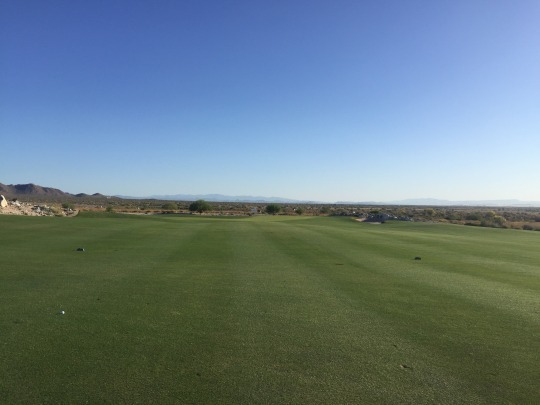 Then, there is a set of tees or combo tees right around 300 total yards apart (actually nine sets to choose from all the way down to 4,646 yards). It may be a tad excessive, but the course is set up well for any skill level and the 300-ish yard gaps are so perfect. I hate when there are really huge gaps between tees. Okay, I think I’ve said enough about the course design for now. The question is, how much did I actually like it? 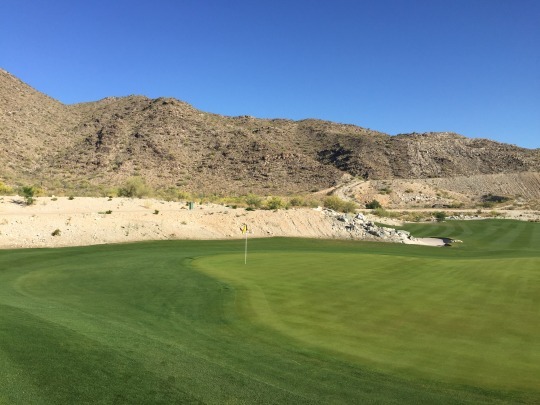 There really is a lot to like about The Victory Course at Verrado. 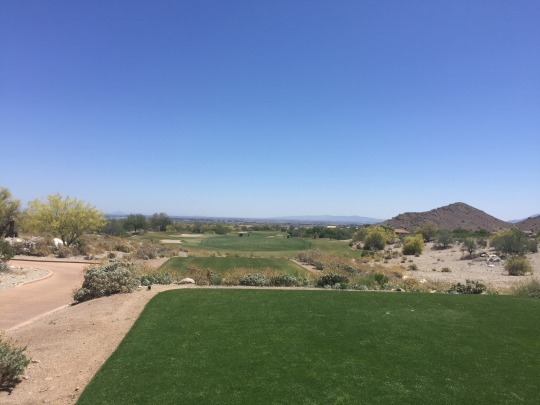 It’s a nice setting, though the natural desert areas here maybe aren’t as pretty as you’ll find in other parts of the Phoenix/Scottsdale area. The design is pleasant and it has several memorable moments, but I never felt truly “wowed” at any point. 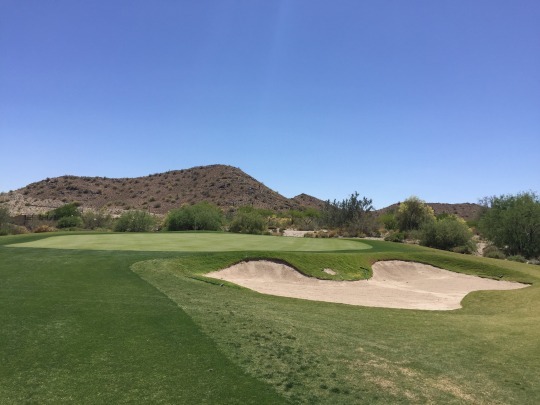 Overall, I’d say Victory is a victory for the western side of the valley and having two good courses will certainly help Verrado raise its stock in the minds of local and visiting golfers. I still won’t say it’s a top-shelf course in a region that is pretty stacked with great courses. However, it is good mid-range option and well worth checking out now or later when it is more complete. I am curious to see how the course and the community mature over the next few years. 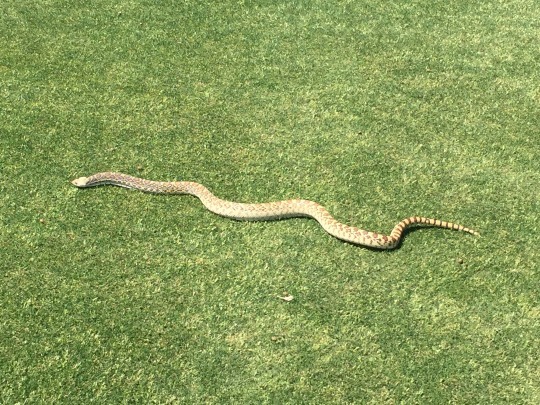 It will certainly evolve into a different golf experience over time. 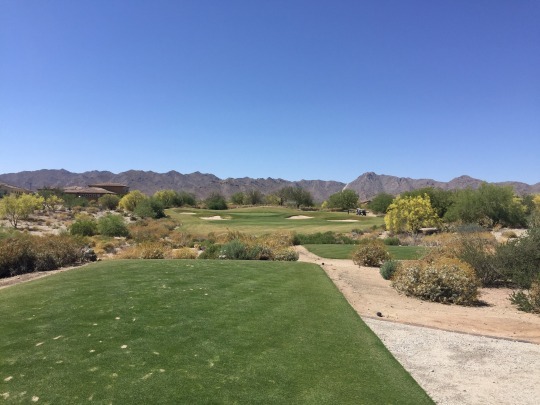 I’ve always heard pretty good things about the original Verrado/Raven course, so I was eager to finally check it out. Check in for my 10:42 tee time was a little confusing because they paired me with a group of seven. It was an awkward start, but I ended up having a ton of fun with the three players in my group. We actually teed off closer to 10:30 and they started us on the back nine for whatever reason. It was very busy out there and we waited on every shot, finishing in about 4.5 hours. The price was $58 (plus tax, damn you Arizona!). 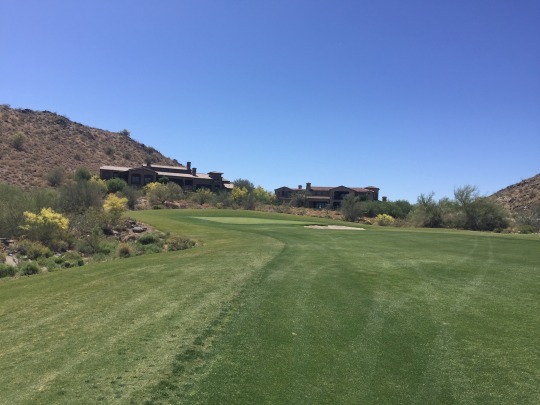 The Founders Course is definitely a more modern residential Arizona kind of course, and therefore had a familiar feel. There are homes (pretty nice homes I might add) along many holes, but none really come into play. Then there are some holes that are pretty isolated with a beautiful desert surrounding. Founders definitely offers much more changes in elevation than Victory, and you get some great views of the sprawling valley to the north and east. 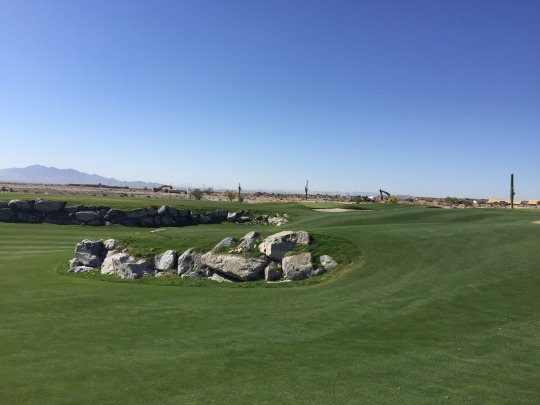 Founders was also designed by Tom Lehman, in conjunction with another well-known course architect, John Fought. The Lehman and Verrado names are the most notable similarities between Founders and Victory, though. They are two pretty different courses, if you ask me, and that is appealing. The holes that stick out as signature designs on Founders are the two finishers, 17 and 18. The 17th is a nice par-3 over water while the 18th is a demanding, long par-4 with water in play on the approach and a nice aesthetic presentation. You play right toward the clubhouse and there is a neat rock bridge just right of the green. My favorite hole might have been the par-3 14th. The tee box is situated on one of the most elevated points on the course and it’s just a nice downhill hole with a great view. If there’s one area where Founders completely blows away Victory, it is the par-3s. 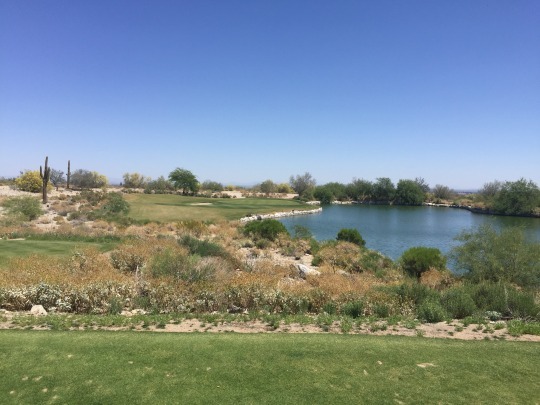 Victory’s par-3s are all flat and fairly underwhelming while Founders has a nice set of holes that use the dramatic desert surroundings to their advantage. Depending on your priorities, you could say Founders is in better or worse shape than Victory right now. When it comes to aesthetics, I give the edge to Victory. It has a much more lush and green presentation than Founders, which is starting to dry/brown out a little as they gear up for the summer transition. 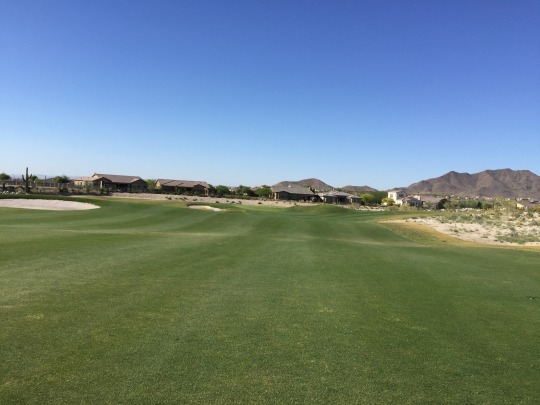 However, Founders has better playability because the turf is obviously much more mature. The tee boxes were good and the fairways were great to hit from with fluffy lies. 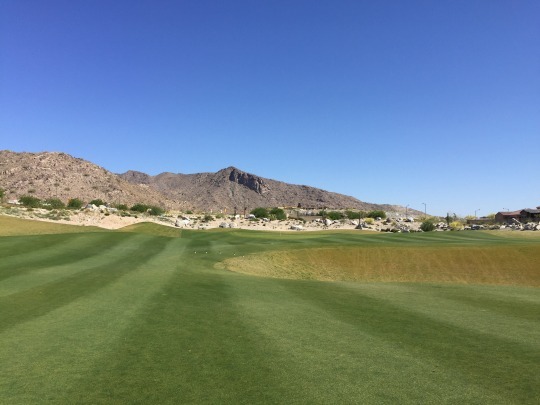 The rough was similar to the back nine at Victory, with the semi-dormant bermuda. It was cut down low here, too (not quite as low), so it wasn’t much of a factor. I was in one bunker on Founders and it was good. The greens on Founders were also pretty firm, but noticeably more receptive on well-struck approach shots and chips. The greens did show signs of a recent aeration. However, they were just about fully healed and putts were not affected at all. 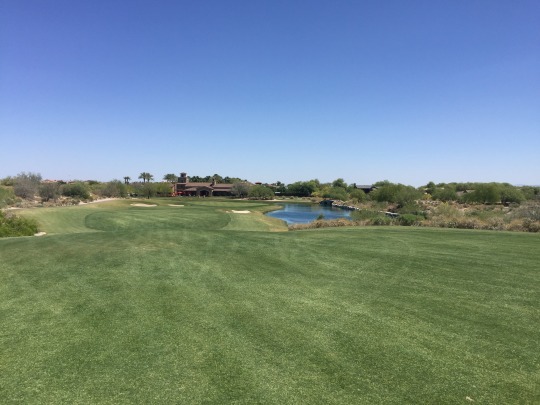 It’s weird because I enjoyed a lot about both courses at Verrado. On paper, all the right elements were there, yet I honestly wasn’t totally blown away by either. I wanted to like them more than I did. 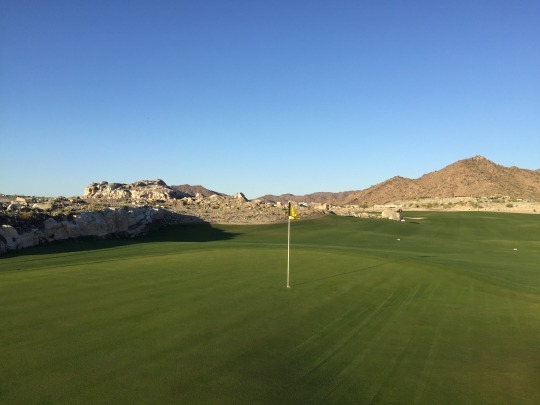 That said, I did like that both courses offered something different and I would still recommend either course to anyone for the right price, especially if looking for something good on the far western side of the valley where options are limited.